Team Effy Saved Over $900 Using DonaitonTo Paid Accounts! After two-year-old Effy was diagnosed with leukemia on July 30, 2013, her family decided to turn to crowdfunding to help them raise the necessary funding to pay for all of her medical expenses. 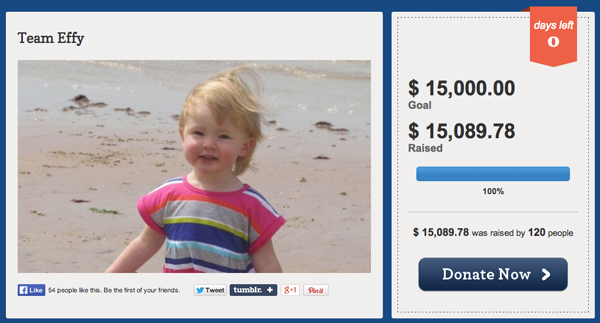 By using DonationTo as their online fundraising platform, the family was able to raise almost $15,000 in less than 3 months. One of the perks of crowdfunding with DonationTo is that we enable all of our users to avoid paying for extra credit card processing fees, and we also make it easy to keep 100 percent of the online donations that you receive. By using one of our affordable and convenient paid accounts, Effy’s family was able to save more than $400 in fees. We also make it easy to begin fighting heart disease with donations, and we have assisted thousands of people with medical fundraising campaigns. Heart disease, also known as cardiovascular disease, can lead to a long list of serious and potentially deadly issues, including cardiac arrest, arrhythmia and heart failure. Therefore, it is crucial to take steps to prevent your risk of fighting heart disease at some point during your life. Additionally, if you are diagnosed with this condition, you will most likely need to make several lifestyle changes in order to improve your odds of surviving. Heart disease is the leading cause of death for people in the U.S., and this makes it crucial for everyone to learn more about this issue so that they can take steps to reduce their overall risk. It is also important to visit your doctor on a regular basis to ensure that you are healthy, and you should schedule an appointment immediately if you begin experiencing some of the symptoms of heart disease, including heart palpitations, nausea, dizziness, weakness, sweating, shortness of breath and a faster than usual heartbeat. It is also common to experience pain in your chest, neck, back, shoulders, throat, jaw or arms. Heart attacks are one of the most common side effects of heart disease. Most people who suffer from a heart attack have coronary heart disease that has not been properly treated. However, even if you are receiving treatment for coronary heart disease, it is still possible that you will end up having a heart attack. There are several different risk factors that will increase your odds of suffering from this potentially deadly medical issue, including smoking, obesity, a sedentary lifestyle, high cholesterol, stress and high blood pressure. Some people are also genetically predisposed to developing heart disease, and this can lead to a heart attack. Men over the age of 50 have the highest risk of suffering from a heart attack, but women who are postmenopausal are also a high risk group. It is vital to seek medical attention immediately during a heart attack. In fact, the longer a person waits to go to the hospital, the less likely they are to recover from this issue. Most patients will be hospitalized for a minimum of 36 hours in a special coronary care unit following their heart attack, and they will receive a mixture of medications that are meant to treat their pain and stabilize their heart. Additionally, it might be necessary to undergo surgery in order to remove a clot, bypass blocked arteries or reopen a clogged artery. Getting surgery can be very expensive even with the best insurance. Fortunately, you can launch a medical crowdfunding campaign to help you collect online donations to help you while you are fighting heart disease. Am I at Risk of Developing Heart Disease? Everyone has some risk of developing heart disease, but your lifestyle habits can make this issue more pronounced. For example, if you smoke, your odds of suffering from heart disease will be 50 percent higher than non-smokers. Unfortunately, smokers are also much less likely to survive after a heart attack. Therefore, it is vital to stop smoking as soon as possible in order to reduce your risk of dying during a heart attack. It is also important to take steps to ensure that your cholesterol levels and blood pressure stay within the normal range. If you are dealing with either of these issues right now, you should ask your doctor for assistance to help you get everything back in line. Other steps that you can take to reduce your risk of developing heart disease include eating a healthy diet that is low in fat and cholesterol, maintaining a healthy weight, controlling diabetes, exercising on a regular basis and taking steps to control your anger and stress. If you are uncertain how to achieve each of these steps, you should consult with your doctor for useful tips. It is important to note that your risk of dying from heart disease increases with age. For example, heart disease is the number one cause of death for postmenopausal women over the age of 40. However, if you implement positive lifestyle habits at a young age, you can dramatically reduce your odds of developing this issue. Unfortunately, one woman dies every minute in the U.S. due to heart disease. Therefore, education about this illness and regular medical check-ups are crucial for everyone. As previously mentioned, there are several lifestyle changes that can help you prevent heart disease, such as eating a healthy diet and managing your stress. It is also imperative to quit smoking because this one negative lifestyle habit will dramatically increase your odds of dying from heart disease. Additionally, there has been a lot of conflicting evidence about the impact of alcohol on heart disease. Because of this, doctors recommend having no more than two drinks per day to ensure that you do not let alcohol hurt your heart. It is a good idea for everyone to eat a diet that is rich in antioxidants, and you should also avoid beta-carotene. Many people believe that vitamin E can have an impact on their heart health, but research has not found any evidence to support this claim. However, you should talk to your doctor about whether or not it is a good idea for you to begin taking aspirin every day. This preventative measure has been proven effective in many cases, but there are some people who cannot safely ingest aspirin on a regular basis. No matter how many positive steps you take to prevent heart disease, it is still possible that you could end up battling with this serious medical condition. If this happens, it is a good idea to consider hosting a medical crowdfunding campaign to help you collect donations for heart disease. After all, the necessary medical treatment will not be cheap, but online fundraising can make the entire process much easier. Heart disease is the leading cause of death for people in the U.S., but this does not mean that you need to give into this potentially deadly medical condition. Instead, you can turn to DonationTo for assistance. Our platform makes it easy to launch a fundraising campaign, and you can begin fighting heart disease with donations in less than five minutes. DonationTo also makes it easy to maximize your donations for heart disease by letting your keep 100 percent of the money that you raise. Additionally, we will enable you to avoid paying for any extra credit card fees. When you consider how expensive medical treatment for heart disease can be, you will easily see why it is so important to choose a crowdfunding platform that will not force you to pay fees of up to 10 percent of the total amount that your supporters donate. Fortunately, DonationTo makes it easy to avoid all of these fees, and you will be able to raise money online 24/7 via your fundraising page.